Easiest. Tuna salad. Ever. 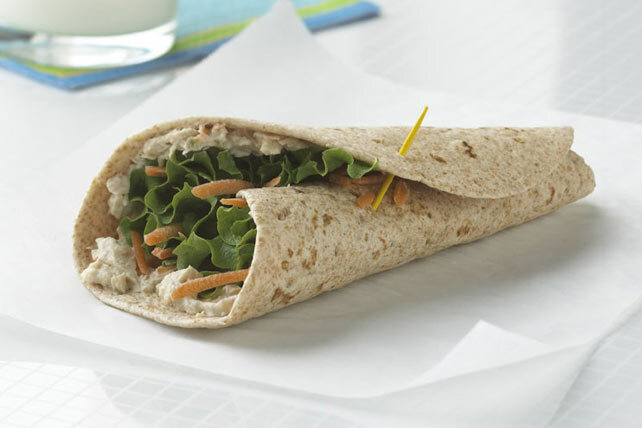 We mixed garden vegetable flavor cream cheese with flaky tuna, then rolled it in a tortilla with a few veggies. Mix tuna and cream cheese until well blended; spread onto tortilla. Top with lettuce and carrots; roll up tightly. Serve immediately. Or, wrap tightly in plastic wrap and refrigerate until ready to serve. Prepare using plain PHILADELPHIA 1/3 Less Fat than Cream Cheese. Prepare using a flavored or multi-grain tortilla.